(866) 576-3027 | Home Remodeling Services Since 1976. If there’s one part of the house that’s known for receiving little attention when it comes to its maintenance and upkeep, it’s the attic. However, the attic plays a major role in the overall performance of any home, and it’s worth it for homeowners to know how a well-kept and maintained attic can significantly enhance your home’s comfort, value, and energy efficiency. While improving roofing energy-efficiency can also lead to decreases in energy costs, attic insulation is another important aspect of the home’s overall energy savings. Reliable attic insulation solutions improve the level of comfort in your home by regulating the indoor temperature in your home, keeping it cooler in the summer and warmer in the winter. At M&M Home Remodeling Services, we’re committed to helping homeowners across Chicago benefit from top-quality home improvement and maintenance standards. In this article, our experts at M&M Home Remodeling Services will focus on discussing blown-in attic insulation and its benefits, so that you can start scheduling your next home improvement project today. What is Blown-In Attic Insulation? 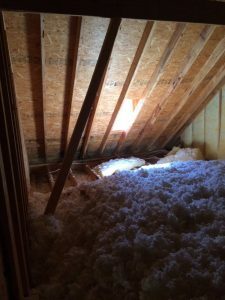 One of the most common attic insulation solutions in Crown Point, Indiana is blown-in insulation, which involves blowing an insulating product around the attic that is normally available in two compositions—fiberglass and cellulose. Fiberglass and cellulose materials have comparable R-values or thermal resistance, but the cellulose variant has slightly higher R-value. Moreover, these insulating products are fire resistant and can be used to top-up and reinforce the existing insulation materials already installed. Fast and Easy Installation: Compared to other attic insulation options, blowing insulation is fast and easy. By hiring a reliable professional for this service, you can be sure that a thermal blanket will be created around your attic, ensuring energy-efficiency, lower costs, and maximum comfort. Energy Efficiency: If you want something to supplement your roofing energy efficiency solution, blown-in attic insulation can serve as a comprehensive and effective option. It is particularly useful in filling the cracks and crevices of your attic, thereby preventing heating and air conditioning from leaking. Noise Reduction: Aside from dealing with the temperatures, blown-in insulation can also minimize the amount of noise or sound that enters your house. After installing better insulation, you can use your attic space and other adjacent areas to work or relax in peace. Contains Recycled Materials: While cellulose insulation is made of recycled newsprint, fiberglass insulation is made of glass fibers which consist mostly of recycled glass. While a DIY approach can work to insulate your attic, nothing beats professionally-installed attic insulation when it comes to saving on energy costs and maintaining a more comfortable home. If you are looking for the most reliable providers of attic insulation solutions in Crown Point, Indiana, contact M&M Home Remodeling Service today. Since 1976, our company has been offering attic insulation and other home improvement solutions involving roofing, doors, siding, gutters, and windows. Being an A+ accredited company with the Better Business Bureau and receiver of awards such as the GAF “Excellence Award” and Angie’s List “Super Service” award, we are indeed committed to providing the highest level of customer satisfaction. If you want to learn more about our attic insulation services or other home remodeling projects at M&M Home Remodeling Services, give us a call now. You can also fill out this quick online form to schedule a free, in-home estimate for planning your next home improvement project today. That is interesting that cellulose insulation has a slightly higher R-value. Maybe it would be good to look into getting some blown insulation in my attic sometime soon made of cellulose. This is something I am going to have to look into getting sometime soon for my home. M&M Receives Top Performer Award at the Owens Corning Conference. How Much Life Is Left in Your Roof? © 2019 M&M Home Remodeling Services. All Rights Reserved.